The original patented RimBlades product. 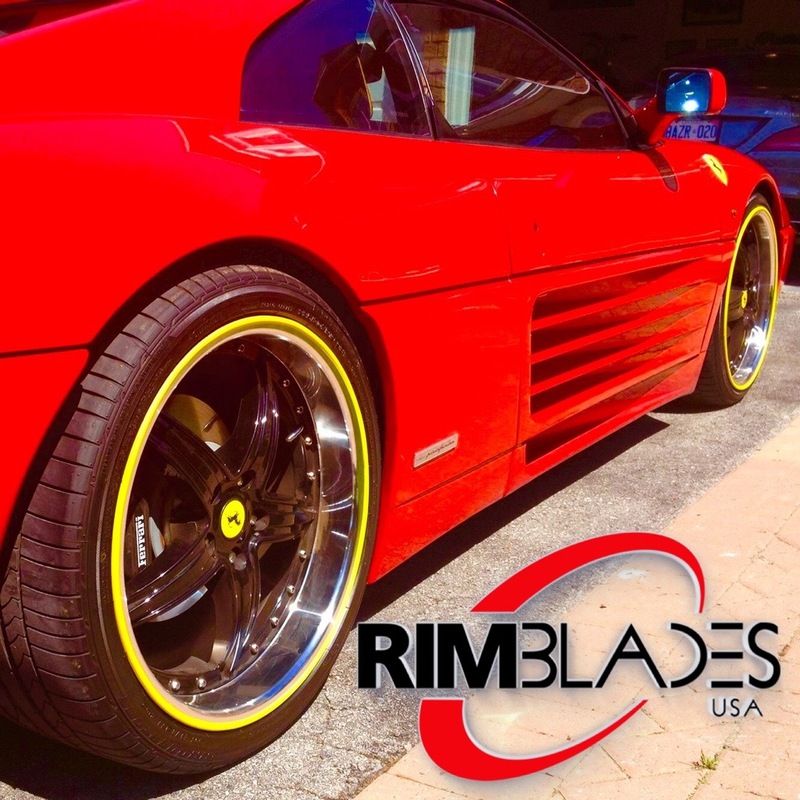 Made from a flexible, heavy-duty proprietary material, RimBlades work on nearly any vehicle rim type. 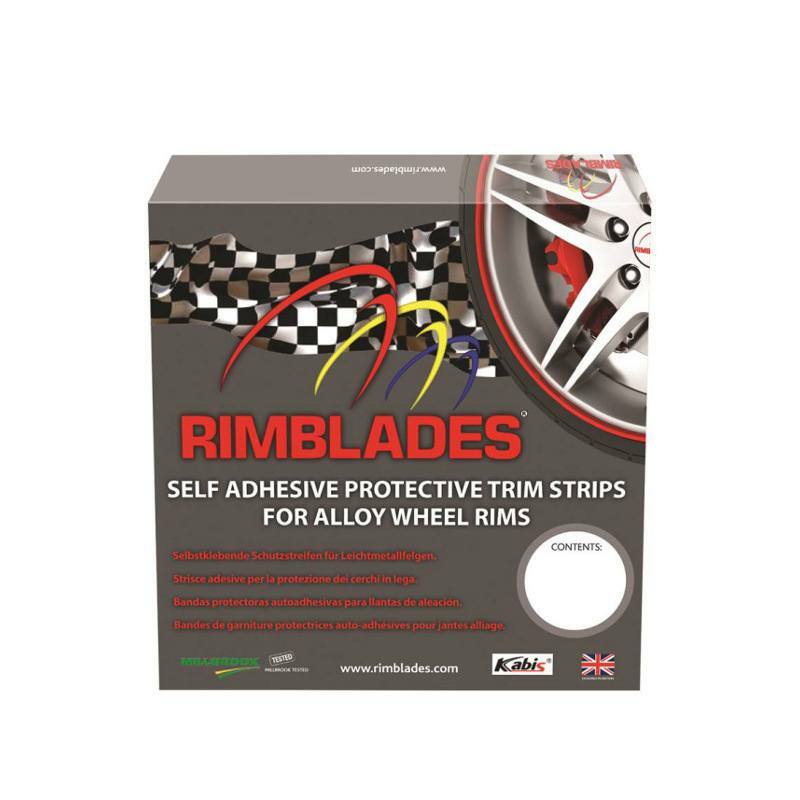 RimBlades offer great all-round wheel protection, second only to RimSavers. NOTE: We are currently out of some colors, and do not have an estimate for restocking. So, if you find your color is not available, please consider ordering another one or checking out RimSavers instead. 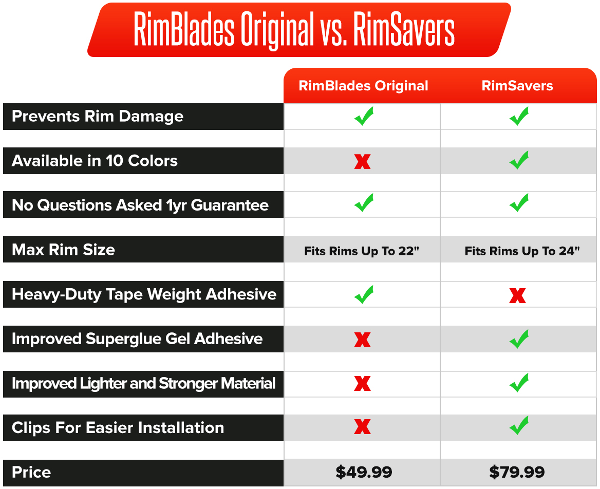 RimBlades vs RimSavers – What’s The Difference? 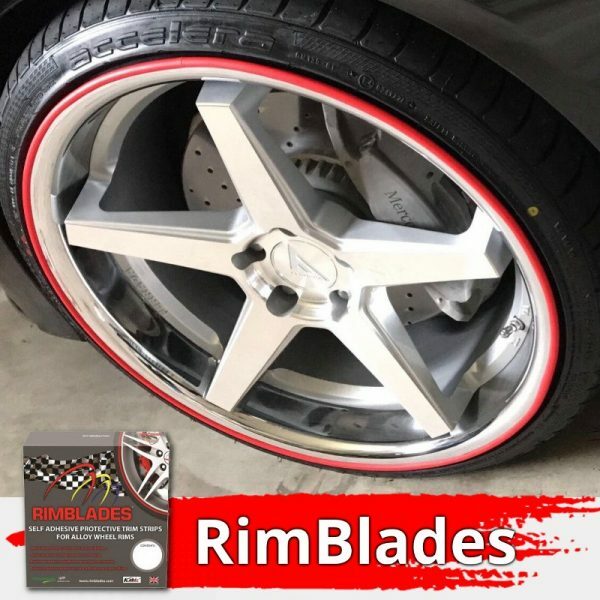 RimBlades alloy wheel rim protectors are our original product, the only curved stick on wheel rim protector with a unique multi-fit profile shape (designed and patented by us). 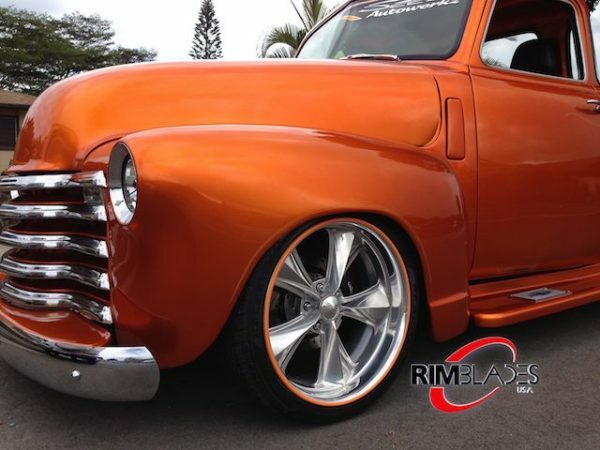 They are designed to conform to nearly all wheel rim shapes, including those with a lip. 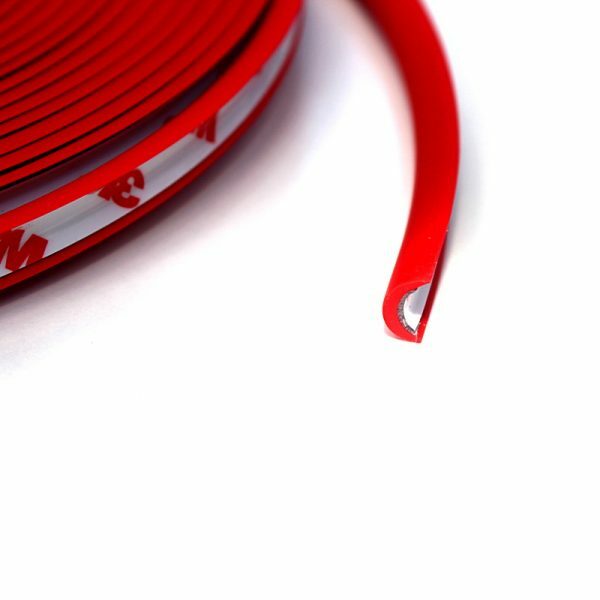 Constructed from a tough, proprietary material, RimBlades are durable and easy to clean. 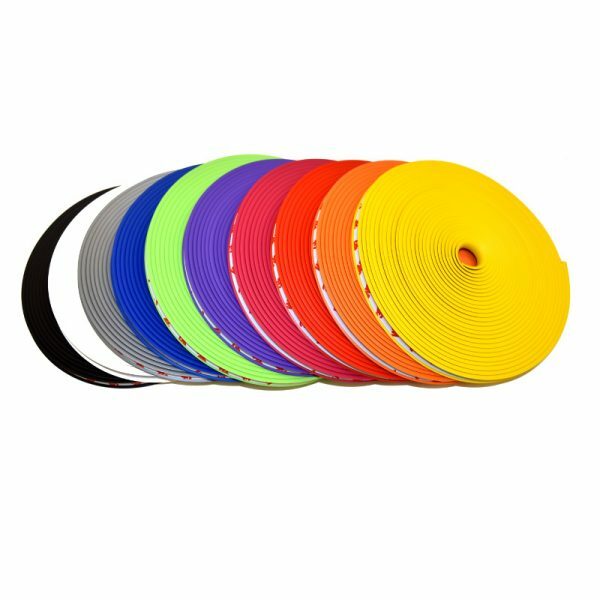 Other benefits of RimBlades rim protectors include the ability to easily install and remove them, making them easy to clean and replace with other rim protector models, along with the easy-to-follow installation instructions we provide. Using our unique rim protectors, you’ll be able to keep your car in good shape while complementing its overall look. Our original RimBlades products are designed to work with nearly any vehicle make and model, while RimSavers offer even more durability. Each RimBlades kit includes a cut-to-fit roll of material long enough to fit up to four 22” wheels, plus cleaning wipes and adhesive primer wipes to ensure a long and lasting bond to the alloy wheel surface. 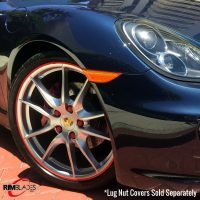 You won’t need to worry about our rim protectors detaching from your wheels with proper installation based on our instructions. The total price includes RimBlades for 4 wheels. RimSavers CLIPS WILL NOT WORK with RimBlades Original. No clips are available for this style. Wondering what a set of RimBlades or RimSavers will look like on your vehicle? This tool is for you! It installed easily and looks great. Unfortunately I don’t know if it actually protects the rim yet. These worked awesome. I followed the instructions carefully. I was able to even cut them where my wheel design comes to the edge of the rim. Has been a few months now, no issues. Be sure to not drive the car for the time specified, clean, and use the primer. I hate that they are $50, but man do they work and if you follow the instructions they look great! This is my second purchase to replace a couple of them as THEY WORKED FLAWLESSLY to protect my wheels. I love these things and they work REALLY WELL! Upon opening my package one of the blades was damaged. I thought I could make it work but if left a bugle in the blade I didn’t report because I used the product upon any and all future orders this will not be the case. But over all great product except that one rim. I’ve had them on for almost a year now, I get lots of compliments on them. They were easy to install. Not good for installation in cold weather. Installs better when you can bend with no resistance. I would purchase again. Very easy shopping hope to enjoy my new RimBlades. 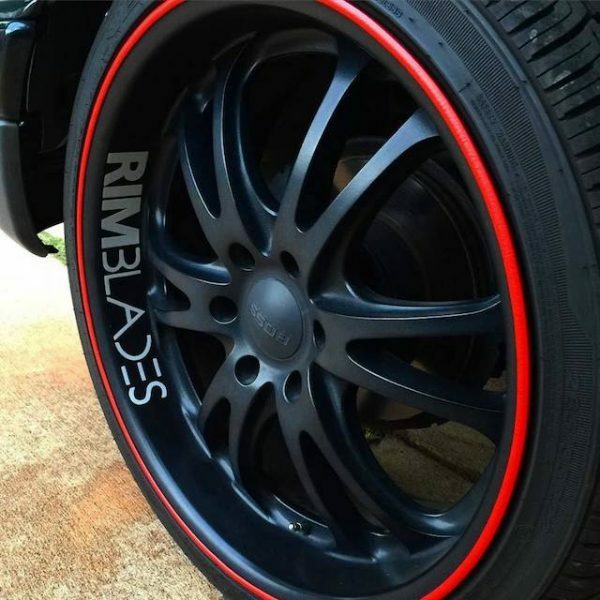 This is my second order, love the RimBlades, Have them for a year now on my Z, these new are for my X3. Had my Scuffs on for a few weeks now – wife curbed the rear right wheel and the RimBlade took the hit enough that there should be no visible rash after I put on replacement! Great experience. This is the second set of RimBlades I have order love the product. I have shopped with you before and I love it. I have a white 2004 GMC Canyon w/ black and aluminum rims size 18’s and with the RimBlades it looks sharp. Keep up the good work guys. I just received the RimBlades for my alloy wheels and looking forward to installing them this coming weekend. Received our RimBlades today. Decided to order a second set for another car. I think the product is cool. However, the color is not what I expected. I was hoping it would be a darker shade of red. Purchased another set for 2nd car because I liked the RimBlades. Adam was great. Best customer service company I have ever dealt with. Would highly recommend them and the RimBlades. Very satisfied! I have installed my RimBlades and they look great on my Tesla Model S!!! I am very satisfied with the look and quality…they give my car a sportier appearance. I love what they do as for as protecting the rims and or covering existing damage. I have a yellow car with black rims. The yellow Rimblades accent the wheels while breaking up the black. I am a happy customer. This is the third set I’ve purchased. I was charged twice for some reason, the first transaction went through but had a separate transaction that did not go through but place a hold on $80 for over a week. The tight rolls that the plastics were placed in for the packaging made it difficult to straighten out for installation. I am looking forward to installing my RimBlades as son as the weather is warmer. Received RimBlades in about a week. Haven’t installed them yet! Awesome!!! Can’t wait to get my new RimBlades for my Chrysler 300S AWD. We are a returning customer, we had Rimblades on our last car for over 2 years, and they were still in good shape when we traded in the car. Waiting to install the RimBlades this weekend. I have used RimBlades before to protect my wheels and they look and work great. So when I get a new car I bought RimBlades to protect the wheels on this car. I recommend RimBlades because they work and also look great!!! I recommend RimBlades because they work and also look great. Very satisfied with the order/delivery experience. I have not installed the Rimblades yet, but am optimistic that everything will go well. You might provide more crazy glue for the seam covers. Also you might put in one more seam cover as an extra one. The seam covers are clunky, they could be lower profile, they kind of stick out visually. The RimBlades look so integrated with the rims. The seam covers should also look seamless. I just installed my RimBlades so time will tell whether they hold up. So far so good.